We gathered data from the scientific and grey literature and from Canadian actors involved in addressing obesity to document the effectiveness of nutrition-labelling policies, as well as their unintended effects, equity, cost, feasibility, and acceptability. Presented here is a broad outline of the results. The nutrition-labelling policies studied target pre-packaged foods or restaurant menus, and require them to display nutrition information either in a detailed format (Nutrition Facts table) or a simplified format (logos). These policies may make labelling mandatory or leave it optional but subject to guidelines with which companies must comply if they choose to display nutrition information on their products. The intervention logic of labelling policies assumes that nutrition information will be read, that it will be understood, and that it will lead to healthier diets, both in terms of quantity and quality, which will help prevent obesity. In practice, this logic holds true, but only for a portion of consumers. Thus, approximately half of them claim to read nutrition information, and often they only read some of it. Detailed information (found in the Nutrition Facts table) is poorly understood, because it is too complex for the literacy and numeracy levels of many consumers. Simplified information in the form of a logo is better understood, which probably explains why this option is increasingly being considered. Nutrition information has a positive effect on food choice, but only for some consumers, and the effect is sometimes modest. Other factors compete with this information to influence food choice, including, notably, taste preferences and food prices. In the case of restaurants, another factor to consider is that dining out sometimes represents an occasion to “treat oneself.” However, in many other cases, restaurants are frequently visited, ordinary eating environments. Finally, the impact of nutrition labelling varies according to population group: it is most effective with women, persons controlling their diet, the more educated, and those with higher incomes. Despite their interest in nutrition information, the elderly have difficulty understanding it. As a way to avoid deepening social inequalities in health, an incidental effect of nutrition labelling seems to interest some authors more than labelling itself. This would be the reformulation of food products. Industry does this in response to pressure from consumers who, influenced by nutrition information, are demanding healthier products. Because reformulated foods benefit even those who do not read nutrition information, certain authors recommend favouring policies that lead directly to reformulation. However, neither nutrition labelling nor reformulation has an impact on the financial accessibility of healthy foods, an issue that particularly affects disadvantaged groups. 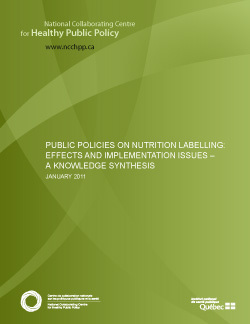 There are some data on the implementation issues related to nutrition labelling. The costs of implementing labelling policies fall to government (i.e. supervision) and, above all, to industry (i.e. nutritional analyses of food products and printing of information) which may pass them on to consumers in the form of higher food prices. These costs are rather modest, at least for large companies. They are far inferior to the estimated economic benefits of labelling policies, which take the form of lower healthcare costs and increased productivity (estimates which must, however, be considered cautiously, since they appear optimistic when compared with the empirical data on the effectiveness of nutrition labelling). The feasibility of nutrition labelling depends on the cooperation of numerous actors from the food industry. Thus, the authorities spearheading labelling policies attempt not only to regulate the industry, but also to consult it. However, this has not always prevented industry from contesting regulations through the judicial system or from lobbying to block the adoption of labelling policies. With regards to concrete feasibility, we brought to light the problems often raised by these policies and the manner in which actors respond to them. The majority of consumers appear to be in favour of labelling on foods and in restaurants, and to prefer it in a standardized, simple, yet informative format. Coercion of industry (mandatory labelling) seems acceptable to consumers, and only a few find nutrition labelling intrusive on a personal level. Industry is often reticent to accept public policies on labelling, even though it introduces many labelling initiatives of its own. Coercion displeases those in industry, but they acknowledge at least one advantage of public policies: the harmonization of labelling, which makes it easier to implement and creates a level playing field for everyone in the industry. The majority of actors working in the fields of health and consumer protection are in favour of mandatory labelling, as long as it is easy to understand. Regardless of the relevance of a given policy, one must keep in mind that obesity is a multifactorial problem perceived differently from one context to another. Any policy proposed must be part of a coherent strategy that incorporates an array of policies chosen from among those best suited to the targeted context.